A refreshing shower or bath with a loofa sponge is often more than just relaxing, it can help you feel cleaner than ever. If you want to start bathing or showering with loofa sponges but you don’t know which one to get, we invite you to go over the products we’ve reviewed down below – it’ll probably help you make up your mind! Loofa (also spelled Loofah or Luffa) actually grows on a vine and is eaten as a vegetable in many parts of the world. Once fully matured and dried, it can be used as a natural kitchen or shower scrubbing brush with a texture that is good for exfoliation. The products on offer online tend to come with different features according to the way they are made, but we’ve concluded that the Natural SPA Beauty Egyptian Organic Loofa by CraftsOfEgypt comes out on top when compared head to head with its competitors. We’ll tell you why below, so keep reading if you’d like to find out! Natural products: Original, natural loofas are usually really good for skin, but products that only appear natural while made from synthetic material could cause the opposite effect. They may last longer than its natural counterparts, but generally, they won’t be as effective. Gentleness: It is of utmost importance that the loofa is treated properly in order to work with the most sensitive of skins, as a rough sponge could not only cause irritation but also permanent harm to an owner’s skin. Durability: poor quality loofas tend to wear down quickly and last for just a few weeks, tops. Looking for products with higher quality standards might mean having to spend an extra buck or two, but it could be better than having to buy a new sponge every week! These sponges by Madholly come with a practical strap with handles and are very easy to use in the shower. They are made from natural loofa and the handles use terry cloth material that is hypoallergenic and non-toxic, according to the manufacturer. Each sponge should be replaced after 1 month of use, and they should be washed individually and by hand. The product seems to fit perfectly into the average person’s hand and they also seem to do very well on sensitive skin. Even though the material is smooth, it does appear to do wonders when exfoliating skin and the design allows for comfortable back scrubbing. The small strap could sometimes feel weak and if treated too roughly it could break down shortly. If handled accordingly, each sponge should comfortably live up to its one-month lifespan and one purchase of Madholly’s product should last you for an average of 4 months. Comfortable design allows the sponges to be scrub most areas of the body while showering. The sponges seem to be very good at exfoliating skin. The manufacturer is clear with the product’s lifespan. One purchase will equal roughly 4 months of use. The handle could break down if treated too roughly. Scrubbing could sometimes feel a bit uncomfortable if the sponge is too wet. 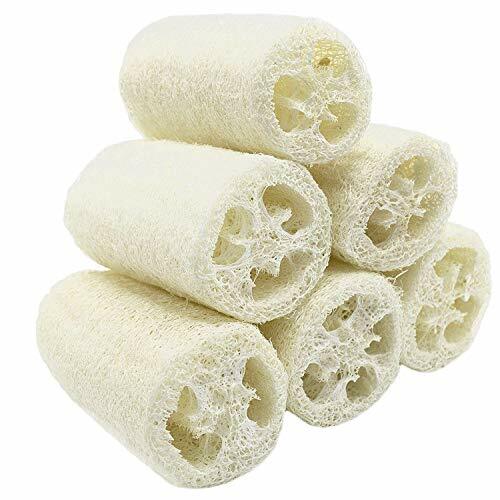 These natural loofah sponges come in a pack of six and could be used together with most types of soap, be it bar or liquid, in order to get the dead skin off your body. They seem to work very well in general, but the size and shape of the loofahs in the images doesn’t seem to properly represent the real ones. They are actually a bit shorter and irregular, though the quality is as advertised. In any case, their diameter does fit the hand perfectly and they are good for exfoliating skin. If you want a big sponge though, then you may want to look somewhere else. The loofahs can be used comfortably to create loofah soap bars and the natural origin of the product doesn’t appear sketchy. If you want a smoother sponge experience, we do recommend the first product we reviewed as they seem to offer a rather soothing experience. Good for washing off any dead skin remnants. Can be used with most types of soap, regardless of its consistency. Each purchase comes with 6 different loofahs. They are smaller than advertised. Not as smooth when pressed against the skin as other products. The shape of the sponges could feel irregular when scrubbing. Unlike other competitors, CraftsOfEgypt offers a single, high-quality loofa. The product might seem underwhelming at first because it is flattened before shipping, but 15 minutes of soaking it in water return it to its original shape. The loofa is soft and works very well when exfoliating sensitive skin. Although your purchase will only grant you one loofa, this product is way bigger than most found online. You can also order the ‘glove’ version for almost the same price if it suits you better. Keep in mind that this sponge tends to feel very soft, so if you don’t like extremes we recommend you check out any of the last two sponges that we’ve reviewed. The fact that there is only one loofa sponge is justified not only by its quality but also by its long lifespan. 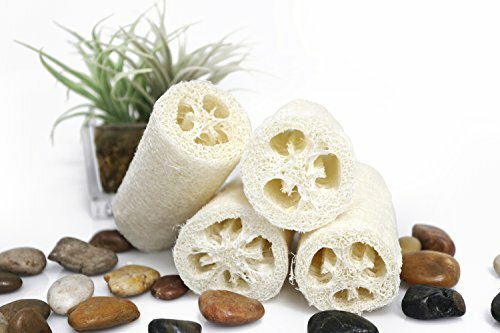 This sponge will almost assuredly last longer than other products that come with over 4 loofas, and the fact that it’s all natural makes it even better! We do recommend changing loofas each month – keep it in mind and check our guide on how to keep your loofas and natural sponges clean for any further references. Really good quality loofa should last for a long time, even with daily usage. Very soft texture helps owners with sensitive skin get the best out of each scrubbing without causing damage. Natural product is grown in Egypt – it even offers a cucumber scent. You only get one sponge with your purchase. Have to cut it down to size yourself. 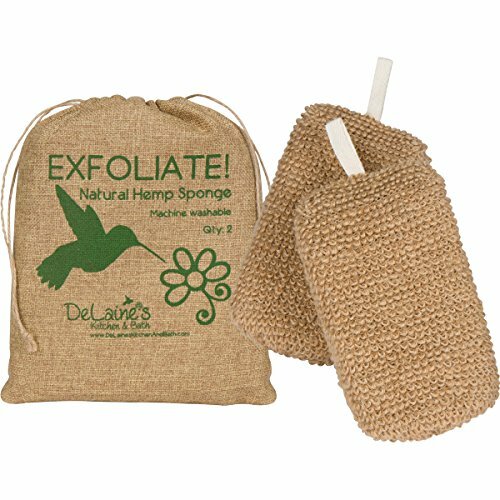 DeLaine’s Exfoliating Natural Hemp Covered Sponges are designed for the ultimate pampering experience. Looking for smooth skin? Use these sponges to tickle your skin with exfoliation. Finally, have the radiant and clear skin that you have always wanted. They are made of hemp, with natural fibers that are great for removing dead skin cells and give you a healthy glow. The pack includes two sponges, which you can use for a longer time; or even use them at the same time – one in each hand! It’s a one-size-fits-all situation. Enjoy a rich lather every time. These are perfect for those suffering from dryness, eczema, and other skin issues. They are made of natural hemp, which isn’t just durable, but also effective in exfoliating. When you are done, just toss them with other linens into the washing machine with some eco-friendly laundry detergent. Why hemp? It’s time to be more conscious about our planet. Hemp is a renewable, more sustainable resource that does not hurt the environment. If you can get the job done and still be eco-friendly, wouldn’t you do it? Even the packaging is 100% hemp! The Voda Reve Back Scrubber is made from durable and high-quality materials. At 4 x 32 inches, the scrubber can let you reach hard-to-go-to areas. 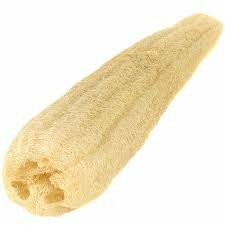 The loofah is 4 x 10 inches and is perfect for exfoliation. If you have dry skin, eczema, back acne, rough skin, or other skin problems, you can benefit from this product. The back part has ultra-soft plush cotton for smoothening and polishing the skin. Use it to clean your neck, back, feet, shoulders, and other hard to reach spots. The size is great for both men and women. No more bending and awkward reaching to clean the entire body. Rest assured that it will not fold, twist, or roll during scrubbing, thanks to the wider strap. The loofah part is just the right kind of rough and soft at the same time. It’s great for legs, neck, and back for a nice exfoliation. Just flip it over to the scrubber side to get a nice polishing – silky smooth skin! This is great for those who are looking for a modern, spa-quality back scrubber. It’s made with actual loofah. Unlike others, it won’t have bristles falling apart. Plus, it’s a friend to the environment. It is completely natural and biodegradable. There is no offensive smell, unlike hemp or sisal scrubbers. It also comes with strong rope handles for convenient drying and storage. Essentially Yours Natural Exfoliating Loofah Sponges are 5 inches long, with varying diameters (this is not mass manufactured, and comes as a natural product). It is more affordable than others in the market, but still high quality. Use these to exfoliate your skin and fix common problems like dryness and irritation. Stop using chemical peels and products – go natural with loofahs. They are organic adhesives that get rid of dead skin cells, so you are left with a healthy, bright, and less oily skin. It also unclogs pores! When you open the package, soak it for 20 minutes in warm water before using for the first time. After use, clean it with water and hang to air dry. Doing these simple steps will greatly increase the longevity of the loofah. The company offers a 100% free refund if you are unsatisfied for any reason. The 100% Natural Luxurious Konjac Fiber Sponge is a gift from South Korea. We all know how great Korean skin care is – that’s why so many of their beauty products have become renowned and beloved all over the world. They have perfected the art of taking care of your skin and face. This sponge is 100% chemical free and is pH balanced so it won’t hurt your skin’s natural balance. Natural bamboo charcoal is incorporated, which is ideal for treating sensitive skin types. As a result, you get a nice fix for acne, pimples, and oily skin. 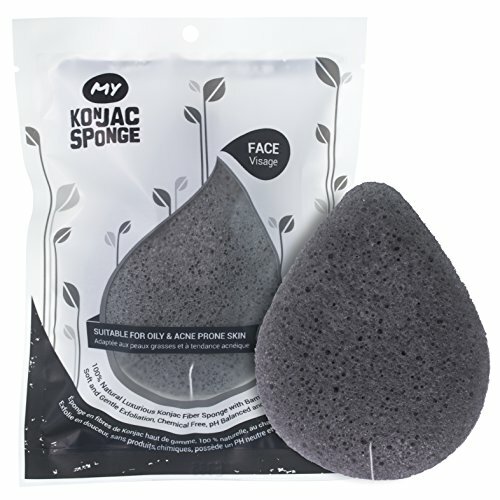 Konjac plant root plus natural bamboo charcoal make up this sponge. The charcoal contains activated carbon, minerals, and antioxidants that have anti-aging properties. They also fight off pimple- and acne-causing bacteria. Each sponge is handmade and comes from South Korea. The Natural SPA Beauty Egyptian Organic Loofa by CraftsOfEgypt might only come with a single sponge, but it offers too many great qualities that simply cannot be overlooked. Its durability, effectiveness, and smoothness work very well with most types of skin and although every product we’ve reviewed offers different benefits, CraftsOfEgypt’s comes out on top thanks to its natural high quality. Bathing could be easier if you use showerheads, don’t you think? We’ve reviewed those as well! Feel free to check out our other articles if you’re looking to get the best out of your showers and baths.